Music in the Classical World: Genre, Culture, and History provides a broad sociocultural and historical perspective of the music of the Classical Period as it relates to the world in which it was created. It establishes a background on the time span—1725 to 1815—offering a context for the music made during one of the more vibrant periods of achievement in history. Outlining how music interacted with society, politics, and the arts of that time, this kaleidescopic approach presents an overview of how the various genres expanded during the period, not just in the major musical centers but around the globe. Contemporaneous treatises and commentary documenting these changes are integrated into the narrative. 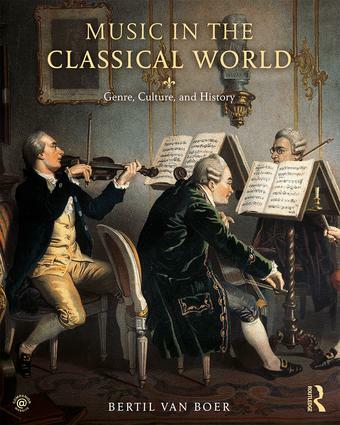 Music in the Classical World: Genre, Culture, and History tells the story of classical music through eighteenth-century eyes, exposing readers to the wealth of music and musical styles of the time and providing a glimpse into that vibrant and active world of the Classical Period.